I went short DECK (118.20) and PCU (100.64) today. Both small, 100 share position sizes. Both shot up on weak volume, along with the market, followed by a failure at major S/R levels. 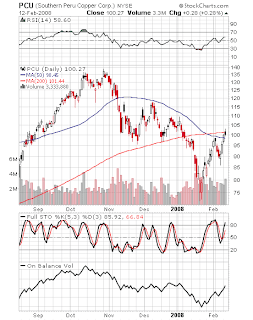 PCU closed under the 200 day moving average, which it had mounted earlier in the day. 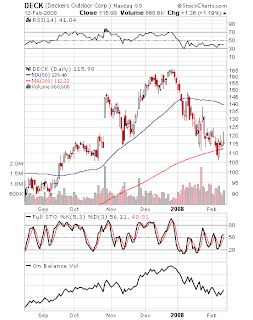 DECK is speculative short in the sense that I did not wait for a break of the moving average. The technicals stink, but there still may be a bounce left in this fad stock before it ultimately crashes. I had some technical difficulties with my mic, so the promised video will be delayed until I can get a new one. I told you you were lucky with your short with fslr take a look at fslr now. It’s not luck, grasshopper. If it was, I would consistently be the luckiest man alive.